I really enjoyed this biography though didn't expect to! Reading the synopsis, the author seemed rather self indulgent, but the reviews led me to give this one a chance and I am glad I did. 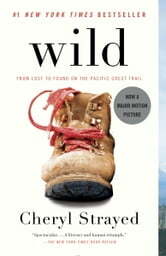 I found myself eagerly awaiting the next time I could pick up the book and read about the next obstacle Cheryl Strayed was able to overcome and wonder how I would fare in her situation. Loved and related in many ways to the brave author of this book duing this time of mouring my own wonderful and glorious mothe who I miss so dearly. There is no love better than your mother's love. Thank you for sharing your journey. Great read! Felt bad for her and was routing for her as she went through her journey. Quite amazing for a young woman to do this all alone. We are all strong in one way or another. An honest memoir of how the author thoroughly messed up her life, being fighting to turn it around. Bought the book because I was keen to read about the PCT, and mostly it didn't disappoint, though I wished she had written a little more on it. I did skip over some parts where the author seemingly went on and on about her life, it was a little overkill certain parts. Overall, a pretty good read, especially for females who I imagine would enjoy her emotional musings a little more.